For now though, that is all. Thanks for all your participation. Don't forget to watch Match of the Day on BBC One from 22:45 BST this evening. You can join us again from 10:00 BST for more live text commentary on Sunday. QPR know defeat at Manchester City will see them relegated while Liverpool need to beat Chelsea to keep their Champions League hopes alive. Real Madrid are still trailing 2-1 at home to Valencia in La Liga. Follow live text commentary of the final stages here. Leicester City became the first Premier League team to win on six consecutive Saturdays since Liverpool in December 2006. An incredible run from the Foxes gives them a great chance of survival. They looked finished a couple of months ago. John Carver says he has ended "probably the toughest week of my life" with a "huge" point against West Bromwich Albion. Carver's side stopped a run of eight successive defeats but the Magpies are still 17th in the Premier League. They are two points clear of 18th-placed Hull with two games remaining against QPR (away) and West Ham (home). "That could be huge," said Carver. "It was important to stop the slide and that run of defeats." Fancy a bit more live football? play-off semi-final first leg here, where Wycombe lead 2-0 at Plymouth. Fancy yourself as a bit of a Mystic Meg? Why not have a go at this? Play our BBC predictor game here. Most of the action came at the bottom of the Premier League today, where, despite beating Hull, Burnley were relegated. QPR know if they lose to Manchester City they will also be relegated tomorrow. For the rest, there is plenty to play for. - Juan Mata had missed his preceding three penalties in English football (all competitions) before netting his spot-kick in this game. - Ashley Young has provided as many PL assists in 2014/15 (four), as he did in the preceding two seasons combined. - Palace attempted more shots (10) than United (eight), excluding blocked shots. - Alan Pardew is the first Palace manager to lose three straight PL home games since Iain Dowie in August - September 2004. More from Manchester United manager Louis van Gaal on Sky Sports: "We haven't played our best match but we have fought to the end. It was very important to win this match and it is a right step to qualification for the Champions League. "Luke Shaw has gone to the hospital but I have good news because he shall go to the airport. It cannot be so bad otherwise he cannot fly." On choosing Juan Mata as his penalty taker: "I had the idea that he would score this penalty. He shot low to the left corner and I think the Palace keeper is best going down to his right. So I was unsure but Mata did it because the shot had enough pace." Manchester United boss Louis van Gaal on BBC Sport: "You never know, we still have to win one point I believe. We have made a very important step. "We have worked so hard, the players showed the team spirit so goo. I am very proud. When you are fighting like this every week, we are difficult to beat. "David de Gea did it several times this season, I am vey happy he saved it because at the time it could have been 2-1 for Crystal Palace." United technically still need three points to guarantee Champions League football. Palace winger Jason Puncheon: "Defeat is difficult to take. I think it was a penalty on me - but these things happen in football. "It has been a good season for us, we have got to take a lot of credit from the performances against Chelsea and Manchester United." Crystal Palace manager Alan Pardew on the defeat: "We were a lot better second half and I thought we would go on and get a victory - or at least a draw. It is galling to be stood here after a defeat." On Manchester United's penalty: "I think the referee's in bad position to say it warrants a penalty - and I've just told him that. The ball came in, there was no real threat and Scott Dann leans in and is turning away. I think it hits the shoulder and his chest. From his angle the referee couldn't tell - it was impossible. I think it is a really tough call." On David De Gea's save from Glenn Murray: "We had a great moment when Glenn had a great chance - it was a fantastic save from one of the best goalkeepers in the world." On Jason Puncheon's penalty appeal: "I'd like to think that if the referee gives first one to Man United, then he has to give that one too." Tom in Brighton: People keep saying job done but - big but - if Liverpool win their remaining games and United lose to Arsenal, they'll need all 3 points on the final day. Could get interesting. Alan in Devon: Sign of a good team, not playing well but found a way to win - lovely. For one day only I'm a Chelsea fan tomorrow. - Manchester United have won 12 and lost none of the last 14 league meetings with Crystal Palace. - Manchester United have lost just two of their last 23 Premier League away games in London (W13 D8 L2) and those came against Chelsea. - Crystal Palace's three direct free-kick goals this season have come against Liverpool, Manchester City and Manchester United. Manchester United winger Ashley Young: "We knew that Palace would come out and put us under pressure at the start of the second half. We showed fighting spirit, and the togetherness we have, to get back into the game. "We came here to get the three points and we're delighted to get them. It's always tough here at Selhurst Park because of the atmosphere - the pitch is quite small and the fans are close to the pitch. We set our stall out in the first half and played some fantastic stuff." On the penalty: "It was the referee's decision to make but I thought the defender did stick his hand on it - I thought the referee got it spot on." On finishing in the top-four: "We talked about having five cup finals left, now we have got another two cup finals to go and get six points." James Carter: Can everyone get over the fact Moyes signed Fellani & Mata. He didn't set either them or the team up right. Van Gaal is the man. Conor Matchett: De Gea won it for us again, and with Blind instead of Carrick we look like an absolute mess in the midfield. Ola Ahmed Dayo: Slate Falcao all u want, but he hasn't been serviced at all. Crystal Palace boss Alan Pardew will be talking to the media soon and you get the feeling he won't be very happy. Did Scott Dann deliberately handle for the penalty? Did Radamel Falcao push a Palace player before the winner was scored? Crystal Palace were undoubtedly a much improved side after the break but Manchester United still had far more of the ball. Wow. Something big is happening in Spain where Real Madrid trail Valencia 2-0 at home. live text of that match here. "Fair play to Palace in the second half. They really came at United but just left themselves open a bit. I think a draw would have been a fair result but it's massive for United. It could be the result that gets them in the Champions League." A bit better than last season eh United fans? A defeat for Liverpool against Chelsea tomorrow and Champions League football is yours. Radamel Falcao had little impact after replacing Wayne Rooney at half time but, looking at the replays, he has created the winner. 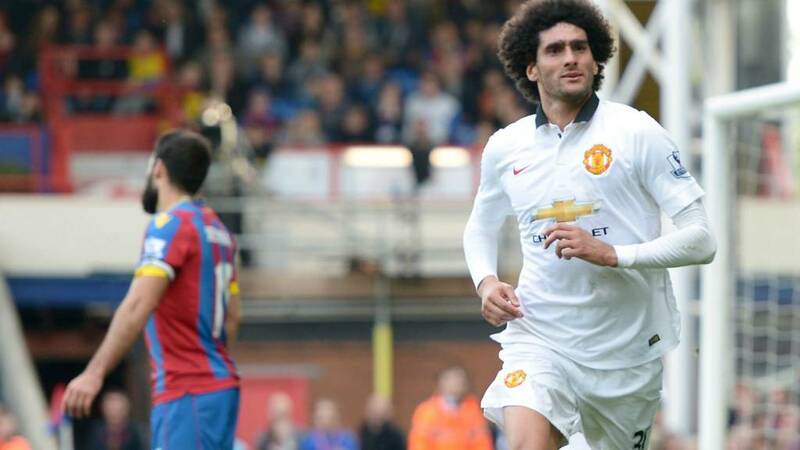 His push on a Palace defender created the space for Marouane Fellaini to head home. Palace won't be happy with either of United's goals. Manchester United move to within three points of guaranteeing Champions League football for next season. Job done surely? Julian Speroni tips Ander Herrera's volley over the bar after Radamel Falcao's through ball. Four minutes of injury time signalled. How's this for a stat? That was Ashley Young's fourth assist of the season - as many as the previous two seasons put together. Ajay Patel: Ashley Young had been the focal point of every United attack. Earned that contract. Paul Humphreys: Felliani has been poor all game but fair play. Young and Mata only good players for us and David de Gea save could have won us the game. Abbey Kun: Strangely it's Moyes' two signings seem to be the ones whose goals may all but guarantee Man Utd's top-four finish. David De Gea to the rescue again as he keeps out Glenn Murray's volley with his legs. Marouane Chamakh replaces Wilfried Zaha for Palace. Palace haven't given this up yet. They have been the better team this half. Wilfried Zaha nutmegs Jonny Evans on the left but Mile Jedinak's cross is over hit. Corner for Palace though. "It's against the run of play and Marouane Fellaini has probably had his first touch of the game. He's done nothing all game but pops up at the right place at the right time. I didn't see that goal coming." How big could that be for Manchester United? Ashley Young has been a danger all afternoon and his deep cross sails over a flapping Julian Speroni and is headed home by Marouane Fellaini. A seventh United goal for the big man and they have all come this season. Looks like Radamel Falcao's little shove in the build up played a part. Champions League football suddenly looks a lot closer for United. Soph in Kent: Palace owe us Liverpool fans an apology for last season. We'll accept it in the form of an Eagles home win. Pretty please? Adam in London: This just proves how reliant United are on Carrick and that LVG isn't as great as people were saying a few weeks ago. Matt Nott in the West Midlands: No excuse for United to be struggling with this squad. Along with Spurs, both teams have arguably better teams than Arsenal and Liverpool. Paul Moore: For the money United have spent they should be in the top 2. Not struggling to stay in the top 4! Poor season. Peter Collins: What a save from de Gea. Stunning strength in his hands! IAMStan: Big Dave yet again. We can't let him go. Palace hit back and Damien Delaney volleys horribly wide from the edge of the penalty area. This game has got a winner. Juan Mata almost gets it for United but volleys over from Ashley Young's cross. Ashley Young leaves Joel Ward standing on the left but his low shot is deflected off Scott Dann and bounces inches wide of the far post. A rare Manchester United chance. "United have just grown back into this game at the moment it's that man Juan Mata who is the most dangerous player on the pitch for United. He's seeing a lot more of the ball." "It should have been 2-1. Glenn Murray misses the best chance he will have all season. It's a great save but he's got to score." How aren't Palace ahead? David De Gea, that's how! Glenn Murray flicks on a long ball to Scott Dann and gets it back from the defender just yards from goal. Somehow though the goalkeeper sticks up an arm to keep out Murray's effort from point blank range. Seconds later, Wilfried Zaha's volley is saved by de Gea. Awful from Ashley Young. The United winger collects the ball from Juan Mata in a promising position on the left of the penalty area but his cross lands in row Z behind the goal. Palace are looking the more likely to grab a winner. Yannick Bolaise and Wilfried Zaha are looking threats on the flanks and United are struggling to get hold of the ball. Liverpool's Champions League hopes may be about to get a boost. Crystal Palace love a free-kick against the big guns. Palace's three free-kick goals this season have come v Liverpool, Man City and Man Utd. Aman Sheth: Not once this season have United soaked up the pressure and turned the game. Either they dominate or crumble under pressure. Belete Eshetea: If Man United don't take the maximum points today, they will lose fourth place to Liverpool. David: Falcao should never get anywhere near a Utd shirt. Worst player in league. Van Gaal shouldn't be trusted if we do not get top four. Palace are rampant. James McArthur races clear and, with Glenn Murray in space, opts to go it alone. His toe-poked curler is just wide of the far post. The second half has been a different game. Manchester United looked so comfortable in the first half, now they are struggling to get out of their own half. Shohidur Rahman: You can already see the difference with Falcao upfront. We can barely get out our own half. Onipede Bamidele: Please, where are Manchester United's midfielders? What are they doing? Hugh in France: United looking ragged. Have been without shape since Shaw went off. That equalizer was inevitable. Fourth defeat in a run coming? "You could feel it coming. Palace have been far the better side in the second half. It's a great free-kick by Jason Puncheon. Great game we've got here now." Alan Pardew punches the air in delight as Crystal Palace get back on terms. Jason Puncheon's delicately curled free-kick takes a slight deflection off the top of the wall and flies into the back of the net. Wilfried Zaha does create some chaos in United's penalty area though with a cross that finds Jason Puncheon. The Palace sub twists and turns inside the penalty area before going down under the challenge of Juan Mata. Puncheon deserves an Oscar for the manner in which he goes down but there is slight contact. Play is waved on though. Wilfried Zaha will be desperate to prove a point against his former employers. He is struggling at the moment, having only made 10 passes all match for the Eagles. Much better from the hosts. Pape Souare races down the left and his low cross is flicked into the side netting by Glenn Murray from an impossible angle. Crystal Palace fans won't be surprised to see their team goalless at the break. That was the fifth first-half in a row they have failed to score in. They look to do more now though as Yannick Bolasie's cross cannons into Ander Herrera. The fans behind the goal scream for handball but absolutely no chance. Wayne Rooney is sitting on the bench and watching intently. His injury can't be that bad then. Wayne Rooney can't continue and is replaced by Radamel Falcao. Crystal Palace make a half-time change with Jason Puncheon replacing Joe Ledley. Just next to him on the pitch, Radamel Falcao is warming up intently. Fair to say most of the play has been in the middle third? Judging by the average positions of each player, I think so. It hasn't been a cracker. It isn't looking good for Liverpool. As things stand, Manchester United will move seven points clear of the Reds in that final Champions League qualifying place. United will still have eyes on finishing in the top three and avoiding the play-off to get into the group stages. Jamie McKellar: Dunno who's just come on but he's a spitting image of Jonny Evans. "Crystal Palace finished the half strongly but if they concede another goal the game will be over. With the league position they are in they can just relax so they should just go for it. "Luke Shaw going off has disrupted Manchester United, but United have been the better side, created the better openings and showed their quality. Palace have played as if they have got their brakes on." Crystal Palace will be slightly aggrieved at being behind due to the manner of United's opener. Scott Dann would argue the handball wasn't intentional that led to Juan Mata's penalty but, the visitors have done more than enough to deserve the lead. Wayne Rooney's race might be run. The striker goes down again after an awkward landing and needs treatment. He will get through to half time but will we see him again after the break? Yannick Bolasie's low cross from the right finds Glenn Murray, but his shot on the turn is well blocked by United's Chris Smalling. The last few minutes have been a bit more encouraging for the hosts. Palace enjoy some late, late pressure but without really creating anything. Four minutes of injury time signalled. Antonio Valencia beats Wilfried Zaha on the right, pulls the ball back to Ander Herrera, whose cross misses Marouane Fellaini's head and bounces off Wayne Rooney to Julian Speroni. Wayne Rooney is at least running a little easier. He almost gets on the end of Ashley Young's left-wing cross but the ball is scrambled clear. Luke Shaw has had an injury nightmare ever since signing for Manchester United this season. It looks the damage was done this time on his landing - perhaps to his neck. Another injury worry for Manchester United as the stretcher comes on for Luke Shaw. He is sitting up but the medical staff look very concerned. The defender took a rogue elbow to the nose from Glenn Murray and doesn't look great. Shaw is stretchered off and replaced by Jonny Evans. Wayne Rooney still doesn't look comfortable. He is limping around and surely won't last much longer? He is now rubbing his thigh. Crystal Palace have to get a grip of this. They can't get hold of the ball at the moment. Having said that, a neat period of possession sends Joel Ward down the right but he tumbles under the challenge of Marouane Fellaini inside the penalty area and play is waved on. "Alan Pardew has to push Wilfried Zaha and Yannick Bolasie on and stop the ball coming out of Manchester United's defence. "The problem for Palace is when they get the ball they are so deep it takes four or five passes to get near the United goal and by that time they have got back." Free-kick to Crystal Palace on the halfway line but Joel Ward punts it forward and goalkeeper David de Gea collects. Wayne Rooney is limping and substitute Radamel Falcao is warming up. Carl Taylor: If that's at the other end of the pitch it's not a penalty, simple as. Andrew Morris: Pen all day long. Dann deliberately moved his arm toward the ball and it hit his arm. Solution? Don't move arm towards the ball! Dee Evans: A referee call that Sir Alex would be proud of! Crystal Palace's heat map above shows the Eagles have spent most of their time defending. They almost get in though at the other end as a free-kick into the penalty area is headed down by Scott Dann but an unmarked Glenn Murray is just unable to put the brakes on in time to reach it. Louis van Gaal will have breathed a sigh or relief when Juan Mata converted that penalty. The Reds had failed to score their last two spot kicks..
"Over the last couple of months Juan Mata has probably been Manchester United's best player. And his confidence showed with the way he took that penalty." United look in the mood. Wayne Rooney's deep cross from the right is headed down by Marouane Fellaini but Ashley Young is unable to steer his stooped header towards goal. Palace are up against it. Fraser McIntosh: The virus at United this week must have been bad. They all look as white as a sheet. Mitul Patel: What's more silly? Wasting two hours of revision or watching United attempt to score. Brandon Clarke: A win for Palace today and suddenly it's exciting to be a Liverpool fan again! "It was a 50-50 decision, Scott Dann has tried to get his body in the way to stop the cross, but as a defender you have to be careful. Was it a deliberate handball? Not for me. "But it was a great penalty from Juan Mata but in the last two or three minutes it has come against the run of play." Wayne Rooney is on the pitch but Juan Mata takes responsibility. The Spaniard takes a few steps back before coolly dispatching the opener. United know win today, coupled with a Liverpool defeat at Chelsea tomorrow, and Champions League football is theirs. Ashley Young's cross from the left is deemed to be handled by Scott Dann, who leant into the ball. Penalty. Skills from Wilfried Zaha. The former Manchester United man jinks one way and the the other to leave Antonio Valencia standing on the left. His cross heads towards Glenn Murray but United clear through Phil Jones. United may not be on form but they have no problems with trips to the capital. They have conceded just three goals in their last eight Premier League away games in London, keeping five clean sheets. Another good effort as Ander Herrera's 20-yard shot screams wide. Good save by the ball boy behind the goal. Ashley Young does well to get down to the bye-line on the left but the quality of his final product doesn't match the approach as his heavy cross sails beyond everyone. Louis van Gaal was talking about a virus that has affected his squad this week. They haven't started as though they are struggling with sickness. "What a wonderful save from Julian Speroni. Manchester United worked it very well but Speroni got the slightest of touches to take it for a corner." Out of nothing, United are almost ahead. Daley Blind picks the ball up 25 yards and his low strike is touched onto the post by Julian Speroni. Good effort. "The key for Crystal Palace is their two wide men - Yannick Bolasie and Wilfried Zaha. Palace will let Manchester United come on to them but there is a lot of space behind Manchester United's defence and when you have the pace Palace have you can take advantage of that." Shohidur Rahman: The fact that Palace have never beaten us in the Premier League makes me even more nervous that they'll beat us today. Michael Devlin: Hope I'm proven wrong today, but I really don't like the automatic inclusion of Fellaini in the starting 11. Jon: You just know that Palace, who have given up last few games since gaining PL safety, will be awesome today because it's United. Wayne Rooney is playing as a lone striker for United in a 4-1-4-1 formation. Daley Blind is playing just in front of the defence. Both sets of fans making a right noise. Only once before have Man United lost four consecutive top flight matches without scoring. That was from March to April 1909 against Blackburn Rovers, Aston Villa, The Wednesday and Bristol City. Surely not? United have started well. Ashley Young is getting jeered with every touch of the ball - perhaps due to his Watford connections? Yannick Bolasie almost races clear on goal with the hosts' first attack but he is comfortably offside. "It's another fantastic game but they are two teams not in great form. Manchester United are desperate to get a win to cement their place in the top four of the Premier League. "Crystal Palace are safe and will be playing in the Premier League next season, but will want to end their season on a high." Listen to commentary from BBC London 94.9 by pressing the audio icon at the top of this page. Before Alan Pardew was appointed Crystal Palace boss, the Eagles had won just three from 20. Since his arrival, they have won eight from 15 and are celebrating Premier League safety. Great stuff from the former Newcastle manager. Crystal Palace XI: Speroni, Ward, Dann, Delaney, Souare, Jedinak, Ledley, McArthur; Zaha, Bolasie, Murray. Man Utd XI: De Gea, Valencia, Jones, Smalling, Shaw, Blind, Herrera, Mata, Fellaini, Young, Rooney. Palace would be best advised ignoring the pre match stats. Manchester United have won 11 and lost none of the last 13 league meetings with Crystal Palace, while the Eagles have failed to score in eight of the last 10 meetings with the Reds. The Eagle is flying around Selhurst Park - another solid performance from the bird - the Crystals are putting on their cheerleading show and the Palace flags are flying. The hosts are safe from relegation but can they celebrate by denting Manchester United's Champions League hopes? We are about to find out. The teams will be coming out any time now. "The Memphis Depay signing looks likely to be the first of many this summer as United seek to ensure that a season of midweek nights in front of the TV never happens again. "Assuming United do qualify for the Champions League, assessing Van Gaal's first season is an interesting exercise. It's certainly not an unqualified success but had been more than the continuation of mediocrity which looked likely in the autumn. "Palace could yet finish in their highest league position since 1991, though not if they lose this weekend. Alan Pardew seems to have restored them to the factory settings which were established by Tony Pulis, but which went haywire during the brief second spell of Neil Warnock. "It's worth remembering that they were 18th when Pardew took over in January and are very comfortably mid-table now, despite the last three results." JavelBleach: Just curious: Is Pardew better under pressure or when there's effectively nothing to play for? A victory at Selhurst Park and United will be pretty confident of avoiding the Europa League. Is that competition worth the bother? Top three would secure you a place in the group stages but, win today, and you will be very close to at least a place in a Champions League play-off. So what has happened in the Premier League today? At the bottom, Burnley are relegated despite a win that knocks Hull City into the bottom three. Newcastle's 1-1 draw with West Brom leaves them just two points and one place above the drop zone. It could be tasty down there. Mark Taylor: Would not be surprised to see Mr Zaha proving a point today. Hope not, but it does seem to go like that in cases like this. Rob Gallagher: United really need to get back to winning ways today and hope that Chelsea can do us a favour tomorrow as well. Phil Johnson: Fellaini starting again for United, guess that means 90 minutes of long balls into the penalty area...oh joy. Crystal Palace boss Alan Pardew: "It is important for this club. We can plan for next season now knowing we are in the Premier League. Hopefully we can throw the shackles off and go at Man Utd and get ourselves a famous win." Man Utd manager Louis van Gaal reveals Robin van Persie isn't the only person in the squad to be affected by a virus this week: "Robin van Persie has been touched by a virus. A lot of players have problems and members of staff. It is not easy to make a line-up. It is always the same in football. "Wayne Rooney can play as a striker and I hope he should score. We have created many opportunities but we have to finish them and I hope the luck is on our side." Crystal Palace make three changes from their defeat at Chelsea. Pape Souare, Miles Jedinak and Glenn Murray come in for Adrian Mariappa, Jordon Mutch and Jason Puncheon. Manchester United could secure their return to the Champions League at the expense of Liverpool this weekend - but only if they win at Selhurst Park against a Palace side who, like United, have lost their last three games without scoring. A victory coupled with a defeat for the Reds at Chelsea on Sunday and Louis van Gaal's men will be guaranteed a top four finish. Good evening. The party has already started for Crystal Palace fans after their safety was secured by results elsewhere this afternoon. You would have had to be the most pessimistic Palace fan to be worried about relegation now but, after today there is no chance of dropping. Can they finish a good day off with a famous win over Manchester United? Live text all the way. Enjoy. They've already started their preparations for next season by splashing out in the region of £25m for PSV Eindhoven forward Memphis Depay. But, for Manchester United, there is plenty of business to be completed this campaign. A Champions League place can be secured this weekend, while they will be desperate to avoid a fourth straight defeat.